Is Huevos Rancheros part of your repertoire yet? (It will be now!) It's one of those dishes where just a few simple leftovers come together to make something so good, it stops you in your tracks. Huevos Rancheros with Salsa de Molcajete in the Adventure Kitchen. I learned to make this salsa from my friend Diana, who is from Mexico City. You can get that recipe here. 1. Warm the beans in a small saucepan over medium heat. As the beans warm, prepare a small, shallow skillet to fry the tortillas, with 1/4 inch of oil warming over medium heat. 2. Meanwhile, if you're including the potato, dice it with the skin into 1/4-inch pieces. In a separate skillet, heat 2 Tablespoons of oil over medium-high heat. Add the potatoes and several generous pinches of salt. Fry the potatoes in the oil, tossing them occasionally, to brown them evenly all over, about 8-10 minutes. 3. Test the oil by dipping the edge of a tortilla into it - when it's ready, the oil will bubble gently but insistently when you do. Fry each of the tortillas in the oil until they are somewhat firm but not crispy. They should not brown at all. Drain the tortillas on paper towels until you're ready to plate everything. Huevos Rancheros with Salsa de Molcajete and a cup of coffee. I bought the tablecloth in these pictures from a vendor at Teotihuacan, the ancient pyramids outside Mexico City, who told me it was made from maguey plant fibers (an ancient method). 4. When everything else is ready, crack the eggs into a skillet and fry them. You can either cook them sunny-side-up or add a spoonful of cold water to the pan and cover it briefly to steam the yolks and tops of the eggs (this is what I usually do). When finished, the yolks should still be runny. 5. When the eggs are done, you're ready to serve. Put a tortilla on each plate, then spoon about 1/4 cup of beans over it. Put one egg on top of the beans, and scatter about 1/4 of the potatoes on the side of each plate. Ladle a few tablespoons of salsa over each egg and serve. If you have your own homemade beans on hand, this is the place to use them. But if you don't, you can absolutely use canned beans (although they may not be as flavorful). About the optional potatoes - this is an unusual ingredient in Huevos Rancheros, but they're actually really nice! 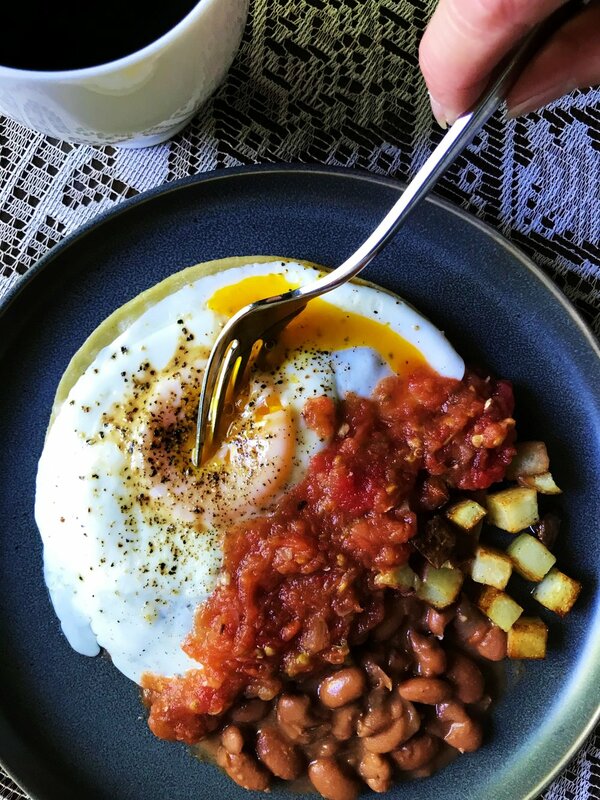 I included them because I originally created this recipe for this cooking series, based on a book series in which one of the characters makes Huevos Rancheros and includes potatoes. If you want to keep things simple, feel free to skip the potatoes. But if you include them, I think you'll be pleased. Salsa de Molcajete is the traditional salsa to use here. You can use this recipe to make a batch in about 20 minutes. If you do, serve it warm.